Why Fake Security Signs Won’t Deter Burglars | Calgary Alarm Inc.
“Home Protected by [Insert Company]. Not only are these signs ineffective, but they actually increase the chances that your home will be targeted by a potential burglar. This is true not only for signs with an fake security alarm company name on them (a sign you’ve purchased off of eBay, for example), but also in the event that the security alarm company is real (but you don’t actually have the security alarm system protecting your house). Under no circumstances should you be using these signs, and here’s why. Most burglars are aware that these signs exist and know how to determine their legitimacy. All they have to do is simply type the security alarm company into a search engine. Alternatively, they could also closely examine the sign during the night with a flashlight to determine its legitimacy. Since genuine signs cannot be easily duplicated, it will be easy to spot a fake. As we’ve mentioned before, signs that have a real security alarm company on them are just as dangerous if your home doesn’t actually have the alarm. With a simple Google search, burglars can look up the specifics of how to test for it and then do so under safe conditions, checking to see if there’s an alarm or not. For example, they might jam the door handle as hard as possible and run away. There are many possibilities. In short, even if you do have a valid security system, do not advertise this to potential burglars. It’s much safer to keep a potential burglar in the dark. Of course, the number one way to protect yourself and your family is to invest in a security system, but motion sensor lights can also be effective. 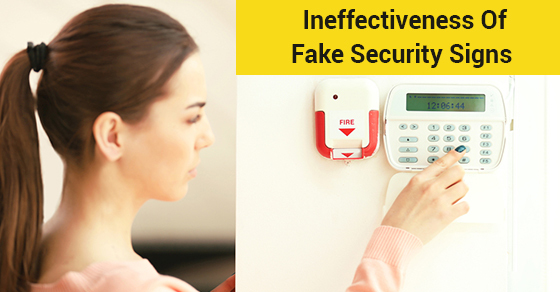 Security alarm monitoring services can also add an additional protection for maximum security. Consider Calgary Alarm for your choice of state-of-the-art yet affordable security systems and 24/7 security alarm monitoring services. We are one of the leading security and monitoring companies in Canada. Contact us today for more information.